With a dark, hard crust and dark, gold dough, Castelvetrano’s traditional “Black Bread” is something special. So much so, that it’s registered by Slow Food as a protected recipe. What makes it “black” is the special mixture of Sicilian durum wheat flour and tumminìa or timilia flour. Tumminìa flour is milled from a rare, ancient grain grown in the Belice Valley (where Castelvetrano is located). The bread, that is baked in wood-fired ovens, is soft, yet dense in texture and has a sweet, yet earthy flavor. Its dark crust is sprinkled with sesame seeds. To give you an idea of how much it is part of the local food culture of Castelvetrano, when we were in town the day before Easter, there was a traffic jam (I am not exaggerating.) in front of the panificio, or bakery, where my friend Sebastiano Chiofalo, co-owner of Gelsomino Imports, LLC, purchased these loaves for us. 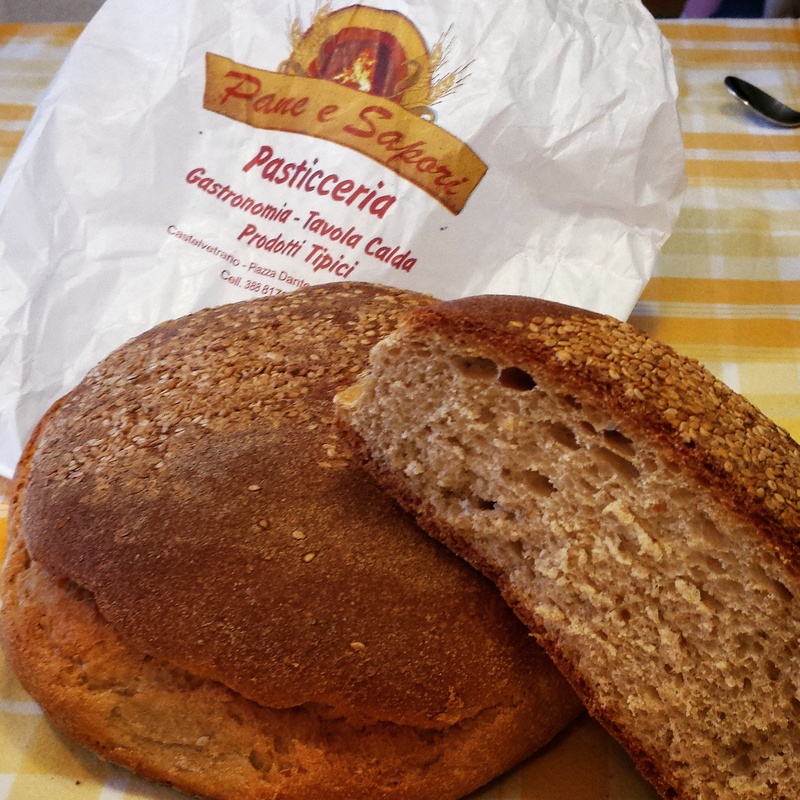 You can read more about Castelvetrano Black Bread, or “Pane Nero” on the Slow Food website. I’m eating breakfast and wish I were eating that bread! If it’s so popular there, it must be really good! I’m with you on that Dana!